It was another beautiful day at “The Grove”, and another wonderful lesson from Sister Johnson. After Sunday School, as I stood next to my truck and looked out onto the cemetery that lies across the dirt road from “The Grove”, an old, hand inscribed gravestone caught my eye. I’d never noticed it before, even though I’ve walked past it every time I visit my father’s grave. The thing that grabbed my attention was the name, Chaffarl Engalrn! What an interesting name. Anyway, back to our lesson. The title of today’s lesson was, FINDING INSPIRATION. The SCRIPTURE for today’s lesson was from II Chronicles 7:1-9. The KEY VERSE was verse 3 which reads, when all the Israelites saw the fire coming down and the glory of the Lord above the temple, they knelt on the pavement with their faces to the ground, and they worshipped and gave thanks to the Lord, saying, “He is good; His love endures forever” (NIV). What Would You Do if YOUR Church Caught FIRE? Luckily for the villagers, their church was empty at the time of the fire. What if it was your church—filled with people—and it caught fire? What if the fire came down from above, during the public offering, and burned up the money in the collection plates or baskets? What would you do? Would you announce it in the church bulletin? Would you grab your children and run for safety? Would you pull the fire alarm or call 911? Would you hurry for a fire-extinguisher or a fire hose? Or, would you panic and do nothing? 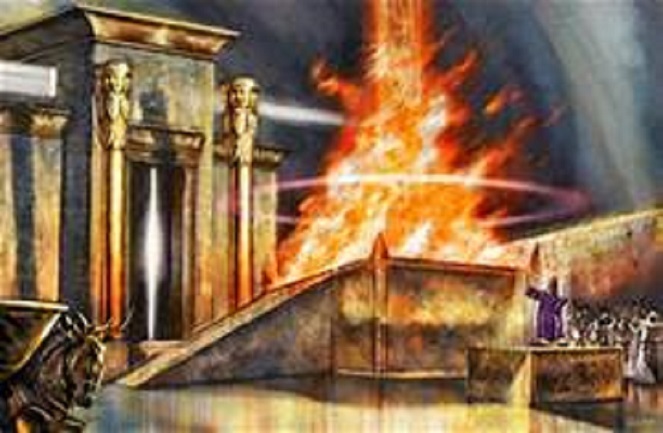 The Israelites were in their church—the Temple—attending a dedication ceremony when all of a sudden, a fire came down from Heaven and filled the church. It consumed the offerings that they’d placed there. The fire was so intense that the priests could not even enter the Temple. But, the Israelites didn’t panic, for they knew that their God desires to have a church that is on fire with His Divine Presence and Power. They knew that the fire was not sent to harm them but to magnify God. Likewise, we should have a church burning with a fire that consumes the unnecessary things of our lives. Our church should be burning with a fire that makes us clean and holy before God. Remember how—in the story—the villagers ran towards the fire; even the atheist? Whenever there is a fire, it attracts large crowds of people. Our church should be on fire like that. It should attract people. Some say, “What we need are some new converts, that’ll set the church on fire!” No! what we need is some FIRE, and there will be people converted!” It has also been said that, “If we could freeze the world’s population, so that no one was born, and no one died, and if the Bible based churches kept winning souls at the current rate, it would take 4,000 years to win the world to Christ!” WOW, we’ve got to do better. Previous STORY “TIME”: WHAT TIME IS IT?